Theodosia (aka Theodocia) is believed to be the name of Clayton Webb’s mother. Her being named as one of the administrators of John Webb’s estate seems to give credence to this theory. At a special court of the Common Pleas, June 8, 1805 — John WEBB deceased. Administrators Theodosia WEBB & William WELLS. Using the ages of their children, we can assume they were born in about the mid-1700s. We know when John, sr. died because of his probate record from 1805. The only death date I could ever find for Theodosia was after 1811, because in a will for their son William, who died in 1811, Theodosia was again named an administrator. While I was researching Clayton Webb’s land records in Hamilton County, Ohio something in one of the documents caught my eye. Clayton Webb land deed, vW1p294, Hamilton County, Ohio. FHL Digital Film #8142621 online digital image 165 of 705. The above deed was dated 1821, and it clearly shows ‘Theodocia Webb‘ as one of the witnesses to this deed. In fact I saw her signature as a witness on three of Clayton’s deeds in this time period. The main take-away from this document is that, obviously, Theodosia Webb was alive in 1821 when she witnessed these documents. Which means she died 1821 or later. Once again land records show their worth. I am curious why am I the first to make note of this information, in all the years folks have been researching the Webb family? Because if they have, I have seen no evidence of it in online family trees. I have always wondered if I was wasting my time researching what appeared to be already thoroughly researched surnames. But this just proves that even though others have researched, and even written books about a particular ancestor and their descendants, there can be something new to learn. Stephen Porter Goble, Stephen, senior’s son with his first wife, Elizabeth Brown. (1832-1866). As one can see in the reading of the will, there was actually nothing nefarious going on, Stephen had already given Stephen Porter his share of the estate, probably when he had married. The fact that Stephen Porter’s heirs are mentioned instead of Stephen Porter himself also clearly indicates that his son had died previous to 1889, so of course I was curious as to why he had died before his father. 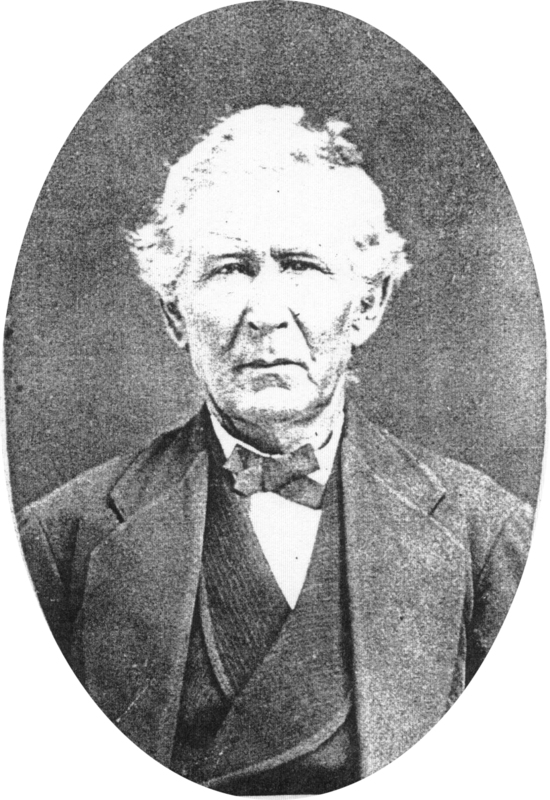 The possibility of it having happened during the civil war was pretty high as he was of an age to have enlisted. At this time, I can find no record of the perpetrator of the crime having ever been caught. This event is an interesting and excellent example of how family stories change over the years, where the basics of the story turn out to be mostly true, but the details get all muddied up at each telling. Who knows what precious heirlooms were lost to the family. Thankfully no lives were. 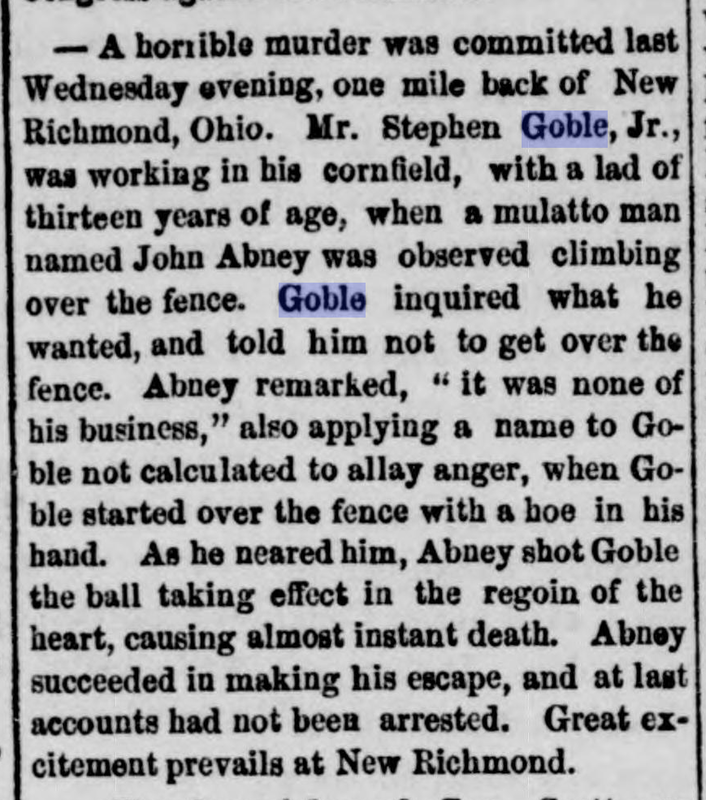 So, we can be relieved that this wasn’t a Goble doing the murdering, but a Goble getting murdered. Although I am sure Stephen Porter would have preferred to have not been the subject of this gruesome post. Will probated April 10, 1889, Wills of Clermont County, Ohio, 1800-1915, Book P, p. 512-517 [image on FHL digital images of these wills is 303-305 of 669]. A Horrible murder…, Taylors Falls Reporter, June 2, 1866, page 23, col. 4; Stillwater, Minnesota weekly. Newark Daily Advocate, Saturday, September 5, 1885, Newark, Ohio, page 1, column 7. Replica of the New Orleans, (built in 1911), the first steamboat that traveled on the Ohio in 1811. The introduction of steamboats on the Ohio River in 1811 revolutionized river travel during the first half of the nineteenth century in America, and by the 1820s the Ohio was bustling with more boats than you could shake a stick at. Early travelers using the river for transportation spent much more time and energy getting from place to place because they had to power the boats themselves. This technology made travel on the water faster and more efficient. The only drawback was the steamboat’s tendency to explode, but this drawback was more than made up for with the speed they could achieve to meet tighter schedules, traveling against the current, and by being able to take more passengers and higher value cargo upstream. Stephen Goble, Senior, probably taken sometime in the 1880s. 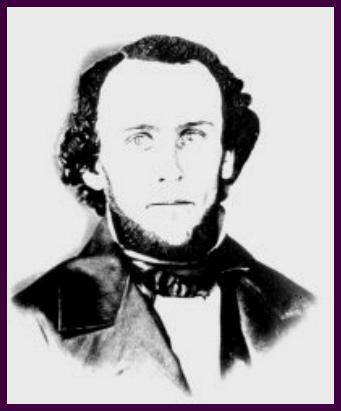 One of those early pioneers of this revolution in river travel was my 3x great Grandfather Stephen Goble, Sr.. Stephen was born in 1804 in Clermont County, Ohio the son of William Goble and Ruth Beck. He was named after his paternal grandfather. The lure of the Ohio River called to him, and one can easily imagine the appeal to a young man of the early 1800s, watching the hustle and bustle of the steamboats traveling up and down the Ohio at all hours of the night and day, with many heading to St. Louis and New Orleans. It must have been quite a sight to see. The thrill of adventure was so alluring to Stephen, that at the age of 15 he had left his family in Bethany and eventually ended up working on the steamboats running the river. By 1826, at about the age of 22, he had become an engineer on the first two lever engine boat that started in Cincinnati, the Wm. Tell.3 I found the following wonderful news articles in the Ohio papers. They give us a hint of his early adventures. River News, Daily Port Register. Arrivals. Personal. We don’t know exactly how long Stephen worked on the river as an engineer although one paper reporting his death indicated that he was involved with the river for over 40 years and other sources say until he retired, which could be at any time.7 In the 1840 census he is listed as being engaged in agriculture, so he was probably involved with both occupations during his lifetime. He was now an adult and had settled down with his first wife with whom he had married in 1824, Elizabeth Brown. His second wife was Alice Brown (sister of Elizabeth), our ancestress, whom he married in 1841. She was about 14 years younger than him. Together they had five daughters of whom Sallie is my gg grandmother, and one son. It is a pity that we can’t go back in time and relive Stephen’s river adventures with him. It must have been a thrilling time. 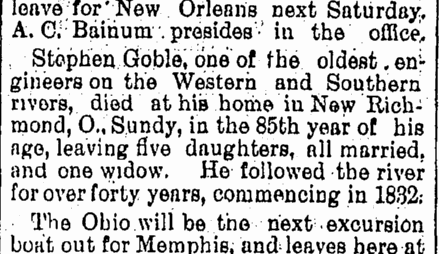 Wednesday, March 27, 1889; Evansville Courier and Press (Evansville, Indiana), page 3, col. 6. The article indicates that he was involved with the river for over 40 years, but I do not know how accurate the information is because they also state he left a widow. Alice had died a few years earlier. It is possible that he both farmed and still was involved with the river over the years.